A new weekly column highlighting the Port Charles happenings during the past week on General Hospital. Read below to find out what you missed or to refresh your memory in time for next week. Peter (Wes Ramsey) found himself tied to a bed in a remote cabin. He was shocked when the door opened and in walked Nina (Michelle Stafford). He assumed she was the one who kidnapped him because she blamed him for Nathan’s (Ryan Paevey) death. Although Nina did feel that Peter was responsible for Nathan being killed, she wasn’t the one who kidnapped him. That was Liesl (Kathleen Gati). Nina refused to be an accessory to a kidnapping (and possible murder) and threatened to contact the authorities to alert them where to find their fugitive. Liesl assured her niece that as the satisfaction of killing Peter would be fleeting, she decided that it would be better to get Peter’s confession on tape before turning him over to the police. That way, they’d get justice for Nathan. Nina reluctantly agreed as long as Liesl kept her word not to kill Peter. But Liesl planned to make Peter suffered as she gagged him and taunted him with a knife. Nina arrived back at the cabin with groceries and interrupted as it looked like her aunt would cut off Peter’s finger. Having consulted with Alexis (Nancy Grahn), Nina told her Aunt Liesl that her (Nina) attorney advised she couldn’t be charged as an accessory unless she helped with the crime. Liesl laughed at her niece; bringing groceries was aiding and abetting in a crime…they were partners in a kidnapping whether Nina liked it or not! Elizabeth (Rebecca Herbst) supported Kiki (Hayley Erin) in the sexual harassment case Kiki brought against Dr. Bensch (James DePaiva). But the sleazy doctor was able to convince Human Resources that Kiki’s allegations were false. After the case was dropped, Kiki asked Lulu (Emme Rylan) to write an article about Kiki’s experience to help other victims of sexual harassment. Ms. Jerome also obtained Alexis to represent her in a civil suit. Lulu and Dante (Dominic Zamprogna) were able to come to terms with her career as a reporter. Meanwhile, Franco planned to invite Elizabeth’s family to their wedding against her wishes. Finn (Michael Easton) joined Anna (Finola Hughes) as she went to Berkeley to tell Robin (Kimberly McCullough) about Peter. While Finn had an awkward reunion with his estranged father (James Read), Anna confessed to having given birth to Cesar Faison’s (Anders Hove) son. Although she understood the position Anna found herself in as a young woman discovering she was pregnant and making the difficult choice to give the baby away, Robin couldn’t accept that her mother had kept the secret for so many years. “Something between us has been irrevocably lost,” Anna sadly told Finn. Michael knows Nelle is lying about Carly pushing her (Nelle) down the stairs and worked with Spinelli (Bradford Anderson) to prove it. Sonny (Maurice Benard) came to see Nelle at the Quartermaine mansion to get her to recant her claim. Carly (Laura Wright) received a surprise visit from Oscar (Garren Stitt) at Pentonville before her trial. The State of New York vs. Caroline Lee Corinthos began with D.A. Margaux Dawson (Elizabeth Hendrickson) calling Josslyn (Eden McCoy), Bobbie (Jaclyn Zeman), Michael (Chad Duell) and Ava (Maura West) to testify. The defense began their case with Diane (Carolyn Hennesey) hoping to establish Carly’s mental illness by calling Griffin (Matt Cohen), Kevin (Jon Lindstrom), Sonny and her star witness, Jason (Steve Burton). But how will Jason answer D.A. Dawson’s question of whether he thinks Carly wasn’t in her right mind when she allegedly pushed Nelle down the stairs when he knows Carly is innocent and Nelle is lying? 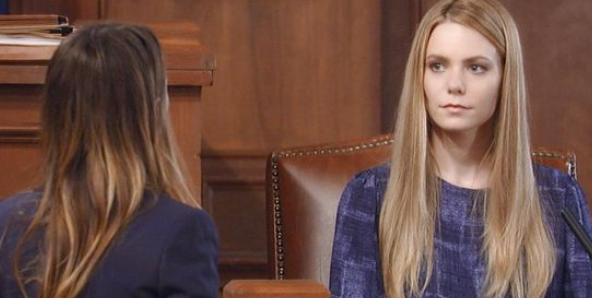 Will Jason’s testimony send Carly to prison? Find out next week on General Hospital. Julian (Willian deVry) asked Kim’s (Tamara Braun) forgiveness for leaving her at the Nurse’s Ball to run after an upset Alexis.